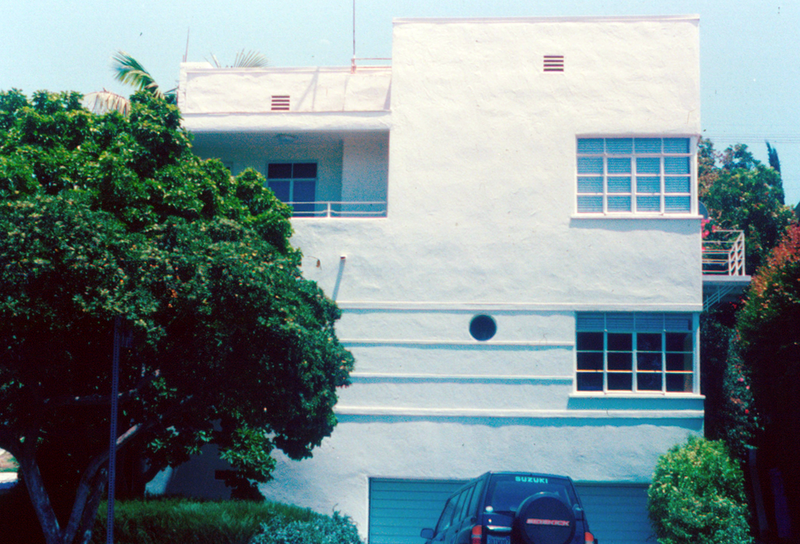 This streamline moderne duplex was designed by architect Harold Ogden Sexsmith in 1938. It consists of a high level of detailing throughout the structure, including dropped-cloud designs in the balcony railings that are reminiscent of the same design used by Greene & Greene in the Gamble House and others. Sexsmith originally came to Los Angeles to teach at what is now UCLA after he was recruited from the University of Washington. He wrote a series of articles in the Los Angeles Times in which he described the best layout for homes and apartments. This duplex, which is built on a very small property, is well laid out, spacious and feels as if it is on a much larger piece of land. It is an exemplification of the type of structure that the architect extolled in his writings.